Take your burger to the next level with these Garlic Parmesan Brioche Buns. 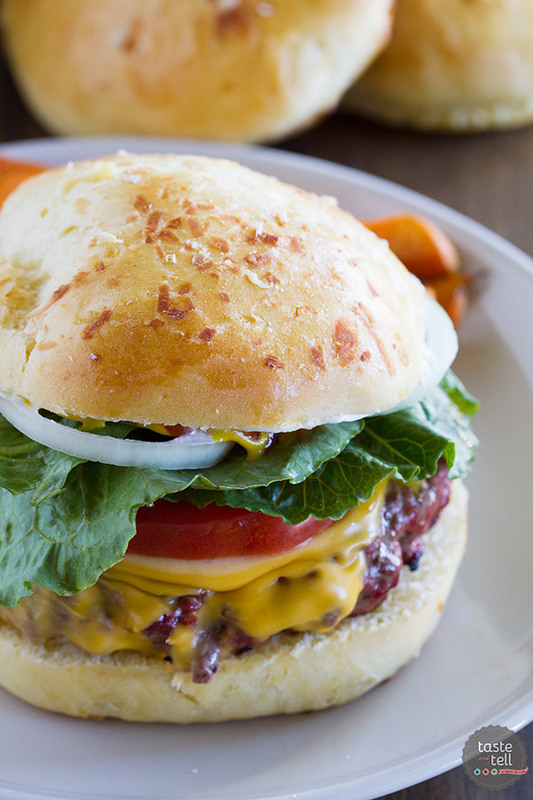 Rich, buttery brioche hamburger buns are filled with garlic and parmesan, turning your ordinary burger night into something special – and perfect for dad. 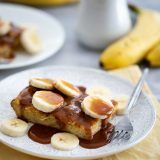 One thing that brought my husband and I together in the beginning was food. We loved to go out when we were dating, but we really loved cooking together. We started dating in the fall, but when the warm spring hit, my then boyfriend showed me just how good he was at the grill. 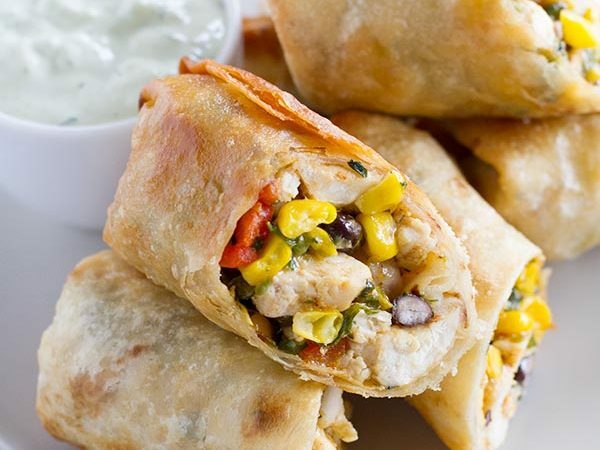 Now that Father’s Day is right around the corner, I thought it would be fun to plan a meal showing him how much he has taught me over the years. I’ve always been pretty confident in the kitchen, but never really confident at the grill. But that has changed in the last 11+ years, because I’ve learned from him! These days, I love to grill. He will still man the grill most of the time, but my confidence has definitely grown. Especially when it comes to burgers. So this year, I’m going to give him the day off and cook him a meal that I know he’ll love. And since I’m all about the burgers lately, I thought it would be fun to make him the best burger ever. And if you are a burger lover, you will know that the bun can make or break a burger. So for his ultimate Father’s Day burger, I wanted to make a deluxe bun. Enter the Garlic Parmesan Brioche Buns. These are based off of a recipe for Brioche Buns that are on the Fleishmann’s® Yeast website, but I wanted to fancy them up with garlic and parmesan. You can’t go wrong with garlic and parmesan! If you’ve never had brioche, it is a rich, buttery bread, thanks to the addition of lots of eggs and butter in the dough. And it’s actually pretty simple to make. 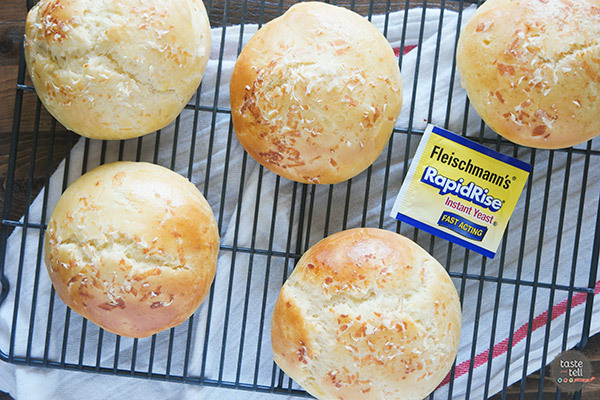 You just need a few ingredients – including my favorite yeast, Fleishmann’s® RapidRise™ Yeast – and with just one rise and only about 20 minutes of hands on time, you can make these amazing buns. One of my favorite things about these brioche buns is that you can start the dough ahead of time, and then leave it in the fridge overnight or up to 24 hours to get nice and chilled. Then it just takes a few minutes to shape them before you let them rise and then bake them off. So they are ready to bake when you are! 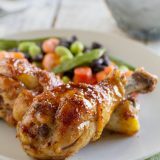 This would also be a great recipe to double up on and invite all of the fathers in your life over for a Father’s Day celebration. 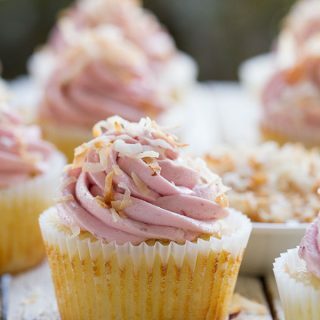 Bake a little extra to share with all of those around you that you love and want to celebrate!! I know I have a wonderful father and father-in-law that deserve a good burger, as well. I love being able to cook for those around me to show them that I love them! 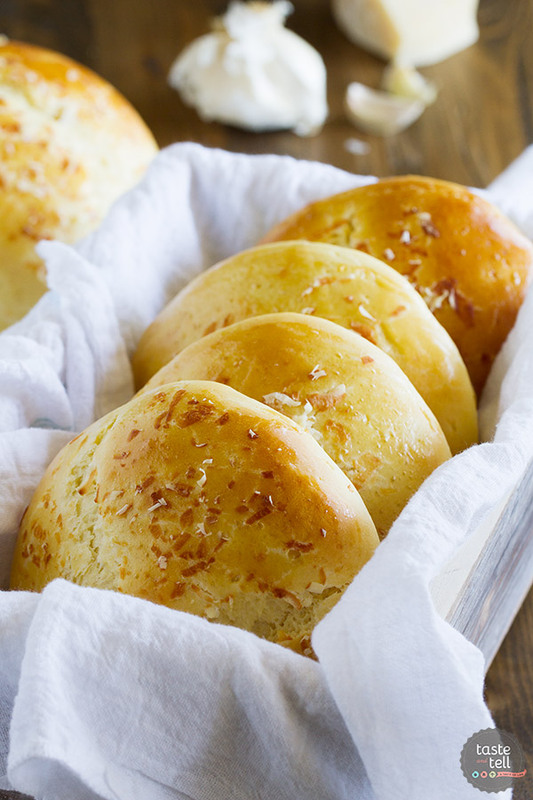 Take your burger to the next level with these Garlic Parmesan Brioche Buns. 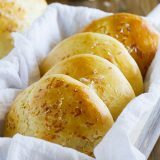 Rich, buttery brioche hamburger buns and filled with garlic and parmesan, turning your ordinary burger night into something special. Combine 2 cups of the flour, the yeast, water and eggs in the bowl of a stand mixer. Beat to combine, then beat on high for 1 minute, until smooth. Cover and let rest for 45 minutes. Add the remaining 2 cups of flour, the Parmesan, garlic, sugar and salt. Beat on low to incorporate. Cut the stick of butter in half lengthwise, then slice into 1/2 inch slices. Put the mixer on medium and beat in the butter, a few bits at a time, until it is fully incorporated. 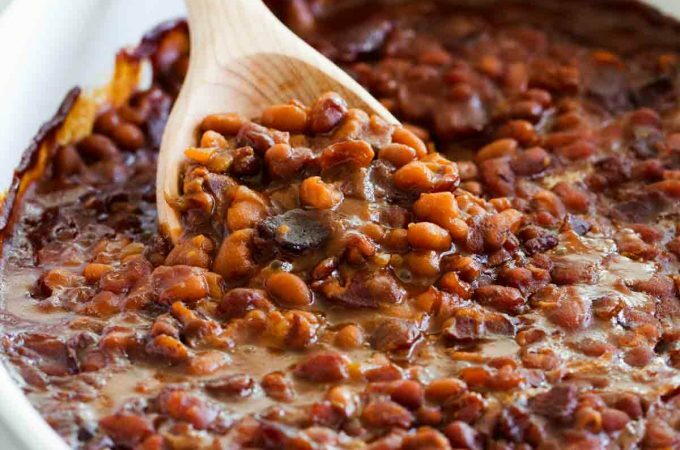 Cover the bowl and place in the refrigerator for at least 4 hours or overnight. 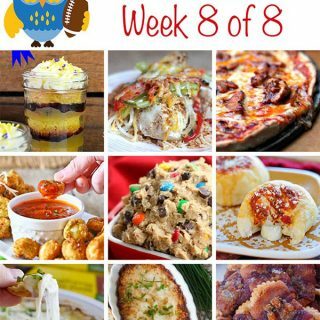 Divide the dough into 8-10 equal pieces. Shape into balls. Place the balls on greased or parchment paper lined baking sheets, 4 to 5 buns per sheet. Flatten the balls with the palm of your hand to about 3/4” high Cover and let rise until they are doubled in size, 30-45 minutes. Mix the egg yolk and the water together. Brush over the tops of the buns, then sprinkle with additional Parmesan, if desired. 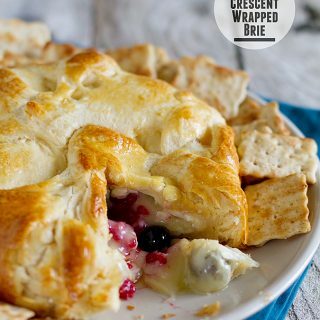 Bake in the preheated oven for 20-25 minutes, or until browned. Remove from the pan and allow to cool completely on a wire rack. time does not include rising/resting time. Buns are best used the same day they are baked. 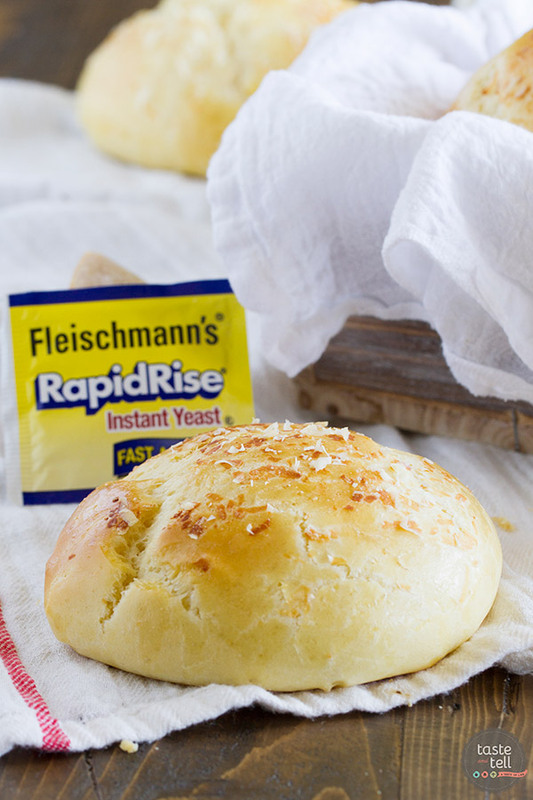 I am a Bake a Little Extra Blog Ambassador and this Garlic Parmesan Brioche Buns post is sponsored by Fleishmann’s® Yeast. I’m so glad to be able to work with companies and organizations that I truly believe in. Thank you for supporting them, too. 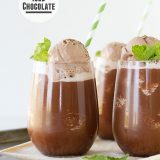 Seriously, these look amazing! Josh loves a brioche bun, he chooses them over all the others usually. 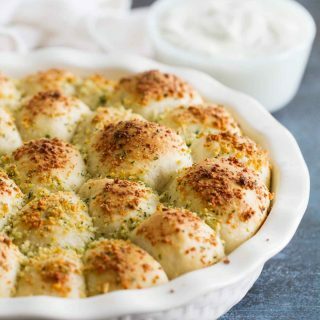 Wow, another garlic parmesan bread recipe! I’ve tried your Divine Breadsticks recipe before. I sprinkled them with parmesan cheese and brushed with garlic butter. We love it! I’m very excited to try this one! I’m so happy you are enjoying the divine breadsticks. I hope you love these, too! !